OTHER SKUNK ODOR REMOVER ENCOURAGE THE USE OF RUBBER GLOVES AND HAVE EXTREEME WARNINGS REGARDING THEIR USE - NOT OURS! PET FORMULA (FOR USE WITH DOGS, CATS, BUNNIES AND GUINEA PIGS): Our Certified Organic Ingredients include: Saponified organic coconut and olive oils, and joboba, lemongrass essential oil, rosemary essential oil, organic aloe, and natural rosemary extract. 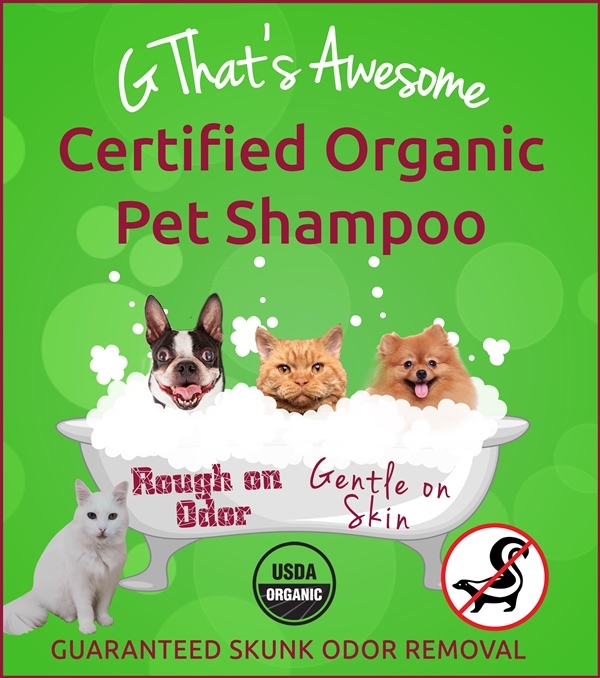 All pets that can bathe can use our shampoo. This product is endorsed and recommended by StovePipeCat a.k.a StovePipe The Traveling Cat. www.StovePipeCat.com. G THAT’S AWESOME SHAMPOOS ARE BORN IN THE USA!